This topic contains 11 replies, has 2 voices, and was last updated by Mikhail 1 year, 2 months ago. I have setup a OPC Demo device receiving data perfectly, but I would like to receive the Alarms and Events from my OPC server. (it is a test event generated from Fernhill OPC server). I dont know if some more configuration is needed to have the events/alarms sent to the Automatic Control Module and therefore have them in my email. Hi, I have added the corresponding signals in data folder in Device 21 ‘OPC Demo’, and now I can see the events coming from the Fernhill OPC server in Device Data window (SCADA Configurator). Then, how can I link this events/alarms to the Email sender? This reply was modified 1 year, 2 months ago by tripode. When an event is received from an OPC server, it contains tag name, called Event Source. You should add the tag “localhost.Sample Structured Text Program” to a DA subscription. You wrote in another topic that you use Automatic Control Module to send events by email. Does it work for now? When you get “Unknown event source” error, the event is not received, so you can’t send it by email. I have added “localhost.High temperature tank” to a ‘data reading group’ folder in SCADA-Communicator and I can see the events coming in ‘Device data’ info window, but the Automatic Control Module only triggers emails for events generated by itself (and works fine 10 min), but it doesnt work for events coming directly from OPC server (or at least I dont know how to trigger that). The ‘Email’ device doesnt trigger anything as I can see that in the log window. But Device 41 ‘Email sender’ doesn`t get the trigger signal to send email. Do events shown in Webstation? Make a screenshot of the Device Data page of Communicator where tags and events are visible. 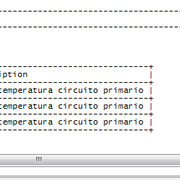 No, events directly from OPC server are not showed in Webstation (only events generated by RapidScada are). Events from OPC server aren not shown in .dat files neither. I can’t see important data on the screenshot, because it’s cropped. Can you find that file in C:\SCADA\ScadaComm\Log and paste it here? I have added a channel number to signal 16 ‘localhost.t primario’ (it was empty), which is linked to alarms generated from OPC server and that tag. Now I have something. So, can you confirm I have to have two channels for each tag? One for value and other for alarm/events? Is there any way to take straighfoward event/alarm messages from OPC AE? You have a one input channel for a one tag. Event must be bound to a tag that is bound to a channel to be passed to Server.